Status: Restoration completed. In showroom. In the first few decades after their founding in 1853 in New York, Steinway and Sons became known as the highest quality and most innovative of all the American piano manufacturers. Their reputation was built almost exclusively by making square grand pianos as the standard instrument for the home, with their pioneering cross-strung design as exemplified in this lovely rosewood instrument. 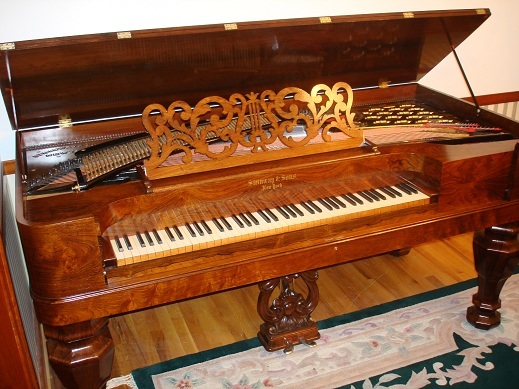 This very early Steinway instrument is serial # 3861, has 82 notes (C to A) and was built in 1860, only seven years after the company was founded, and in the first year of the American Civil War. Steinway's early invention of cross-stringing and multiple bridges in 1855 allows for longer strings and more notes in a smaller case, without compromising tone or resonance. In 1877, a full seventeen years after this square piano was built, Steinway finally invented a way to adapt cross-stringing in grands, creating the first truly modern grand piano. Steinway won accolades and international awards for their concert grands, but by most estimates, more than 90% of the pianos Steinway built before 1880 were squares. The historical fact that Steinway, Chickering, and most other early American piano makers grew their reputation building almost exclusively squares is disregarded by most modern piano rebuilders, who often dismiss the square design now as "dead end", "space saving", and "inferior by design," regarding scale, tone, and action. It is probably more accurate to say that modern piano technicians generally know little about the history, design and proper restoration of these instruments. And the assertion that the best-known piano manufacturers in America spent 40 or more years building 90% or more of their instruments to a dramatically inferior design and successfully marketed junk to what was certainly a more discriminating clientele than today, is simply not a credible historical interpretation. This instrument came to Historic Pianos in unplayable condition, unable to hold a tuning and with the finish so damaged by sun, water, and oxidation that it was not easy to tell what sort of wood it was made of. However, the Brazilian rosewood under the damaged finish was in a state of excellent preservation, and during the instruments restoration a number of wonderful and unique features of this instrument came to light. The original ivories were well-preserved with little damage or wear. The legs are an ornately faceted 8-sided design that is finished in real rosewood, unlike most later Steinway squares where the legs were finished in faux-grained rosewood that is more difficult to restore to their original beauty. The stringplate had been originally half gilded and half finished in black lacquer highly decorated with gilt accent, and it was possible to largely preserve the original decoration. The original spruce soundboard was dirty but entirely intact with no cracks or separations, and with excellent retained crown and string downbearing. Penciled notes hidden inside the instrument detailed tunings in the first few decades of the instrument's life, as well as a restringing in July 1883. Based on the small size of the existing tuning pins and the excellent condition of the original pinblock, it appears that the instrument had only been restrung once, and it was possible to obtain excellent tuning torque using new #3 tuning pins. Like many early squares, the instrument is double-strung throughout, with only the lowest 10 bass notes single strung. The instrument was fully restored in 2010 using traditional materials including hide glue, traditional hand-rubbed shellac / oil / pumice French Polish wood finish, and shellac / bronzing powder gilding. Much of the restoration focused on restoration and regulation of the action, which required the fitting of new hammers, new damper felts, all-new action cloth, new silk action cord, new leather parts and new wool felts. The original cloth, cord, leather and felts were damaged by moths, mice, and age. The instrument was restrung with new custom overspun copper bass strings and steel treble strings, sized for the original scale, and the instrument is tuned to A-440 modern standard pitch. The action is the standard square action of the time, with a distinctive touch that is very responsive and expressive. The instrument's timbre and tone is distinctively that of a square piano, with a pronounced attack, and a long sustainted tone in the bass, that is appropriate for much of the late classical and early romantic music of the mid 1800's.